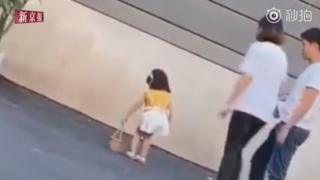 A mother has apologised after a video showing her kicking her daughter led to a wave of criticism online in China. The video has been viewed by more than 22 million people and many voiced their outrage. A lawyer from the women's federation in the city of Hangzhou said the act was "suspected domestic violence". A baby care company revealed the child to be Niu Niu, a well-known clothes model with whom they work. Niu Niu's mother has issued an apology saying the incident was "absolutely not child abuse" and tens of thousands of people have been discussing her response. It is unclear who shared the original video, which was filmed on 8 April, but it has been widely shared by the newspaper Beijing News. Niu Niu's mum has been criticised for both kicking her daughter and for using her to generate an income. On the Twitter-like platform Weibo, one user's comment, "relying on your child to earn money is one thing but yet you still kick her? ", has been liked 2,000 times. Another wrote: "I really feel for your daughter. At that age she's supposed to be carefree, but she's making money for you. She is not a tool." China News Weekly says that Niu Niu works with many local businesses and that her cute appearance has meant that "orders have been large". In reply, Niu Niu's mum told Beijing News: "My husband has a job, our family does not rely on Niu Niu to make a living." She has also set up her own Weibo account and posted an apology saying: "There was no harm caused in this video of me disciplining, I am deeply sorry that this video has been misunderstood by you all. "My daughter and I are close and she absolutely receives the best care and love." More than 70,000 people on Weibo have been discussing the apology and some think that no harm was done. "This is not child abuse, although I can't see much love," said one person. Something that is thought to have emerged after China ended its one-child policy is the concept of spoilt rotten or "bear children". There has also been a lot of debate in the country about whether people should use force to discipline their children, but Niu Niu's mum says everybody does it. She told Beijing News: "No parent can say that they've never laid a finger on their child. "I have very rarely hit my child. I did it one time because it was dark and Niu Niu was running on the road and at the time I was frantic. How could I kick her in the leg for no reason?"